The dollar rose to its highest level in a week against its G10 peers on Wednesday, rising for the 4th day against the yen and most pairs as investor focus shifted to the minutes of the Federal Reserve’s last policy meeting. The dollar hasn’t had it this good this year, bouncing 1% so far this week after slumping 1.5% last week to the lowest level in 3 years, as traders unwound short positions ahead of today's January FOMC minutes (where the most likely surprise would be the Fed's endorsement of 4 rate hikes in 2018), with investors looking for clues on just what policy makers had in mind when they added “further” twice to their guidance on interest rates. After yesterday's bond supply deluge, Treasury yields in the belly were steady ahead of the continued glut of supply this week, and the 10Y traded virtually unchanged and just shy of 2.89%. The Treasury’s $258 billion of auctions slated for this week comes amid a rapid jump in rates that gave impetus to one of the steepest equity sell-offs in years two weeks ago. And while investors seem to have adjusted to 10-year yields at a four-year high for now, the deluge of supply could push them even higher, above 3%, weakening the case for owning stocks at elevated valuations. Meanwhile, US futures and world stocks looked set to fall for a third straight day: MSCI’s world stock index down 0.1%, declining for the 3rd day, as a down day in Europe offset earlier gains in Asia. Investor attention will be on the minutes of the Fed’s last policy meeting in late January. The last readings of U.S. wages and inflation came in higher than expected, with some blaming the numbers for prompting a violent selloff in stocks earlier this month. “Markets are particularly sensitive to inflation, and we think the odds that the minutes reinforce the narrative of firming inflation are high,” said Elsa Lignos, RBC’s global head of FX strategy. "We think there is a high probability that the Fed moves the dots to four hikes in 2018 (from three) near-term and that the minutes could be another step in that direction." European equities led lower by technology, while FTSE 100 outperforms slightly after earnings from Lloyds and Glencore. In terms of sector specifics, telecoms outperform their peers amid strong earnings from Orange (+2%), to the downside, energy names lag their peers amid price action seen across the commodities complex. Other individual movers include Glencore (+4.1%), Lloyds (+1.6%) and who sit near the top of the FTSE 100 following their respective earnings. Elsewhere, other notable movers include Accor (+2.4%), Atos (-3.7%) and Iberdrola (-3.4%) post-earnings, whilst AA (-22.1%) lag the Stoxx 600 after a disappointing strategy update. 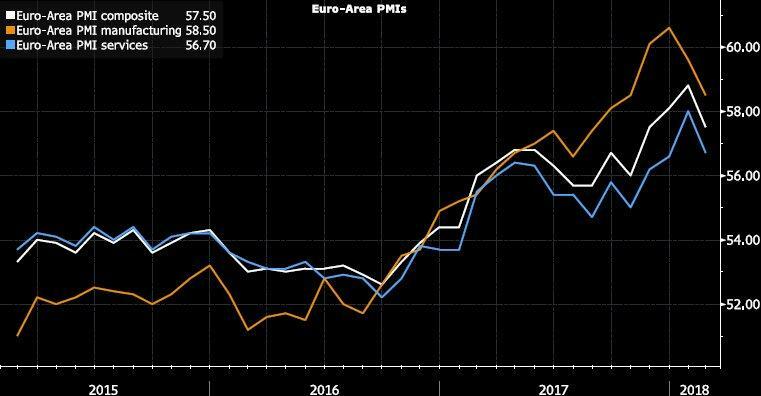 Lower than expected readings of purchasing manager surveys in France, Germany and the euro zone all came in lower than expected, stabilizing euro zone bond markets. Bunds rallied from the open across the curve; UST/bund 10-year spread widens toward key 220bps level, which was last seen in January 2017. Earlier during the Asian session, MSCI’s index of Asia-Pacific shares outside Japan rose 0.7 percent after slipping earlier in the session following the U.S. market losses, which snapped a six-session winning streak. Stocks climbed in Hong Kong ahead of China's return from the week-long Lunar new year holiday on Thursday, cementing a rebound from one of the worst sell-offs in years at the start of the month. As the Asian session progressed a combination of the fall in US equity futures and 1% declines in crude prices, the Nikkei had briefly dipped into negative territory. Elsewhere, the ASX 200 (+0.1%) had opened lower in response to the falls on Wall Street but has recovered into positive territory. Mining names the largest drag on the index with BHP and Fortescue both losing ground following soft earnings. Hang Seng (+1.8%) traded higher amid HSBC shares recovering from yesterday’s declines. In FX, after soft U.K. domestic employment report, GBP/USD extends losses through yesterday’s low while gilt futures hit two-week high. The euro traded in a narrow range that was yawn-inducing for traders even though euro-area PMI missed estimates, while the pound was buffeted by weak jobs data out of the U.K. EUR/USD edges lower to approach 1.2300 as USD continues strength seen from last three sessions. However, not even the weaker Euro could push European stocks higher. Asia’s emerging currencies were mostly lower amid a rising dollar and elevated Treasury yields. The Taiwan dollar the main exception as it reopened after the Lunar New Year holidays. Sovereign bonds advanced and Taiwan led regional stock gains. A deluge of new supply is pushing down Treasuries and spurring speculation the U.S. 10-year yield could breach the watershed 3 percent level as early as this week, which would reduce the attractiveness of developing-nation assets. The Federal Reserve will release minutes of its latest meeting later on Wednesday. "The ongoing USD rebound alongside higher UST yields is likely to pressure Asian currencies,” said Mizuho's FX strategist, Ken Cheung. "With a light calendar, the USD movement will remain the main driver for the Asian FX. The CNY fixing after the long holiday will be the focus," with recent developments suggesting no big changes, he said. In the neverending drama surrounding Brexit, a UK Official said they are in a broad alignment with the EU on the transition period. Meanwhile, PM May is facing pressure after 62 Tory hardliners demand clean Brexit, with lawmakers challenging May to take a harder approach on how far UK rules should move away from the EU after Brexit and the nature of the transition period. The stronger dollar weighed on commodities, with Brent crude futures losing 1 percent to $64.61 per barrel and U.S. crude oil futures also slipping 1 percent to $61.16. U.S. crude hit a near two-week high the previous day on news of inventory declines at a key storage hub and from expectations that top OPEC producers could extend cooperation beyond 2018. Spot gold touched a one-week low of $1,329.42 an ounce due to the resurgent dollar, having declined 1.4 percent so far this week. On today's economic data calendar, we have Markit PMI data and home sales. Scheduled earnings include Dish and The Southern Company. U.K. Dec. Unemployment Rate: 4.4% vs 4.3% est; Avg. Weekly Earnings 2.5% vs 2.5% est. Asian equities are trading with modest gains this morning, in what has been a relatively quiet session. Nikkei 225 (+0.2%) had been up as much as 1.2% with the JPY continuing to weaken across the board in which USD/JPY hovering around 1.08. Although, as the session progressed a combination of the fall in US equity futures and 1% declines in crude prices, the Nikkei had briefly dipped into negative territory. Elsewhere, the ASX 200 (+0.1%) had opened lower in response to the falls on Wall Street but has recovered into positive territory. Mining names the largest drag on the index with BHP and Fortescue both losing ground following soft earnings. Hang Seng (+1.8%) traded higher amid HSBC shares recovering from yesterday’s declines. In credit markets, the US Treasury curve is modestly flatter in the Asia-Pacific session, with the 10-Year yield last 0.4bp higher at 2.89%. JGBs trading in a tight range, with the 10yr up by 3 ticks. 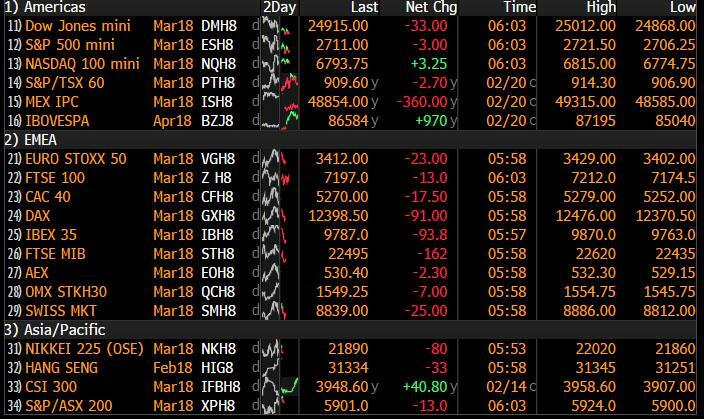 European equities (Eurostoxx 50 -0.7%) trade lower across the board amid lacklustre Eurozone PMIs and a dip in US equity futures overnight. In terms of sector specifics, telecoms outperform their peers amid strong earnings from Orange (+2%), to the downside, energy names lag their peers amid price action seen across the commodities complex. Other individual movers include Glencore (+4.1%), Lloyds (+1.6%) and who sit near the top of the FTSE 100 following their respective earnings. Elsewhere, other notable movers include Accor (+2.4%), Atos (-3.7%) and Iberdrola (-3.4%) post-earnings, whilst AA (-22.1%) lag the Stoxx 600 after a disappointing strategy update. In currencies, Asian contacts are said to have attributed the latest Dollar leg-up to a further ‘technical correction’, and for the DXY 90.000 will be next on the radar given its psychological significance, but chart-wise nearest resistance resides between 90.500-600 as the index trades within a 89.935-700 range. Looking at basket components, Usd/Jpy has built on gains above the 2017 low (107.32), but stalled just before 108.00 amidst another bout of global stock market weakness. However, Jpy puts at the big figure have reportedly been in demand as the headline pair hovers around 107.50, with bids seen at 107.20. Eur/Usd is testing key Fib support at 1.2319 and buying interest into 1.2300 in wake of French, German and pan-EZ flash PMIs that missed consensus across the board. A downside break of 1.2300 exposes recent lows circa 1.2275 and stops below, but on the upside 1 bn option expiries run-off today between 1.2300-20. GBP initially faced selling pressure in the wake of the latest UK jobs figures despite the firmer than expected earnings ex-bonus release (prev. revised lower), with the report met by an unexpected uptick in the UK unemployment rate, slowdown in employment growth and the earnings release perhaps not enough to change the narrative at the BoE and nail on a May hike. However losses were then pared as it appears that the UK are now in a broad agreement with the EU on a transition period. Aud/Usd another notable mover, and retreating some distance from 0.7900 towards 0.7842 interim support despite former than forecast Aussie wages overnight as the breakdown was not as encouraging as the headline numbers appeared. In the commodities complex, WTI and Brent crude futures are seen lower alongside the firmer USD after taking a tumble during Asia-Pac trade. In terms of energy specific newsflow, things remain light ahead of tonight’s rescheduled API release with traders wary over any further climbs in US production. In metals markets, spot gold has recovered from modest overnight losses to trade relatively unchanged as markets await today’s FOMC minutes release. Elsewhere, price action across the rest of the complex remains light as Chinese participants away are still away from market. Looking at the day ahead, the flash February PMIs on manufacturing, services and composite are due in the US. Other data due includes January existing home sales data in the US. Away from this, the FOMC minutes from the January meeting are due late in the evening, while the Fed's Harker is scheduled to speak on the economic outlook in the afternoon. Today is the biggest day in a quiet week for data. The highlight will be the flash February PMIs with manufacturing, services and composite readings due in Europe and the US. As a reminder, the January manufacturing reading for the Euro area came in at an impressive 59.6, albeit slightly down from the highs above 60 in December and November last year. The consensus is for another small pullback to 59.2, while the composite is expected to edge down to a still solid 58.4 from 58.8. Outside of this, we also see the monthly UK employment release with eyes on wages as the BoE gets closer to their next hike. UK data and/or BoE hawkishness has caused global yields to sell off sharply a couple of times in recent months so the release will be important. Finally FOMC minutes from the January meeting (Yellen’s last) will be out tonight but it will be outdated news given it occurred before the higher AHE’s and CPI/ PPI prints and before the market sell-off. ($28bn at 2.255%) reaching the highest in c10 years. Notably, demand for the securities were reasonably sound with bid-to-cover ratio of 2.74x, 3.11x and 2.72x (vs. 3.22x previous) respectively. Looking ahead, auctions for 5 and 7 year notes will occur in the next two days. Elsewhere, core 10y bonds yields were little changed, with the UST 10y up 1.5bp to 2.89% while Bunds were flat and Gilts fell 1.7bp. The UST 2y was up 2.9bp to 2.221% and is higher again this morning. In US equities, the S&P fell for the first time in seven days (-0.58%) with all sectors but tech stocks modestly up. The index was weighted down by the consumer staples sector, in particular Walmart as it fell the most in c30 years (-10.2% vs. -10.3% in Jan. 1988) after guiding to a lower than expected earnings outlook and a slower push into online sales. The Dow (-1.01%) and Nasdaq (-0.07%) also retreated. Conversely, European bourses were broadly higher as the Euro weakened and largely reversed Monday’s decline. Across the region, the Stoxx (+0.60%) and DAX (+0.83%) both rebounded while the FTSE was marginally lower. Elsewhere, the VIX is up for the second straight day and now back up above 20 (+5.9% to 20.60). This morning in Asia, markets are modestly higher, with the Nikkei (+0.05%), Hang Seng (+0.98%) and Kospi (+0.47%) all up as we type. Elsewhere, the February Nikkei manufacturing PMI eased mom to 54 (vs. 54.8 previous). Recapping other markets performance from yesterday, in FX, the US dollar index jumped 0.69% while the Euro and Sterling fell 0.56% and 0.03% respectively. In commodities, WTI oil rose for the fourth consecutive day (+0.39%). Precious metals weakened c1.3% (Gold -1.28%; Silver -1.34%) and other LME base metals also retreated modestly (Copper -0.39%; Zinc -0.14%; Aluminium -1.31%). Away from markets, the Handelsblatt reported that given Germany’s strong support for Spain’s Economy Minister Luis de Guindos to be the next Vice President of the ECB, unnamed German officials now hope this would set the stage for Bundesbank’s Weidmann to be first ECB President from Germany after Mr Draghi’s terms ends in October 2019. According to these officials, the swing factor may depend on the relative support of French President Macron. Staying in Europe, the EC spokesman Ms Schinas said the EU is “deeply concerned” by any US trade sanctions impacting EU businesses. She added “we would be taking appropriate measures to defend EU industry, and we stand ready to react swiftly….in case our exports are affected by restrictive trade measures from the US”. Now onto some of the Brexit headlines. When asked if the UK will withhold the divorce Brexit payment to achieve the trade deal that it wants with the EU, the Brexit Secretary Davis said the “withdrawal agreement and the future relationship (between the UK and EU) are intertwined….and not separate issues”. He also noted trade must be as open and “frictionless” as possible between the two sides and that the UK and the EU will continue to work together as partners on regulations, where the UK is determined “to lead a race to the top in global standards”. Elsewhere, Foreign Secretary Johnson has said “there is no reason” why the UK and EU can’t have frictionless trade if Britain leaves both the customer union and single market. Conversely, the opposition leader Mr Corbyn has confirmed the Labour Party will support Britain remaining inside a customs union. He noted “we have to have a customs union that makes sure we can continue to trade, particularly between Northern Ireland and the Republic of Ireland…” Looking ahead, we should have more clarity next week when PM May is expected to set out her vision for the post Brexit trade deal after extensive cabinet discussions this week. Her task has been made more difficult by an open letter from 62 Eurosceptic Tory MPs insisting on elements of a hard Brexit just as hope was emerging that she could find a united cabinet position. Finally onto some central bankers commentaries. The Riksbank Deputy Governor Floden said “we have to be cautious moving forward not to surprise markets too much (on rates) and generate negative market reactions….for example…too rapid appreciation of the Krona”. He added, “most likely” we will raise repo rates in 2HCY18 and then “roughly 50bp per year under the forecast horizon”. Before we take a look at today’s calendar, we wrap up with other data releases from yesterday. In Germany, the January PPI was above market at 0.5% mom (vs. 0.3%) and 2.1% yoy (vs 1.8% expected). The February ZEW survey on the current situation was lower than expected at 92.3 (vs. 93.9) with the expectations index beating at 17.8 (vs. 16 expected). For the Euro area, the February ZEW survey on expectations eased to 29.3 (vs. 31.8 previous) while consumer confidence was also below expectations at 0.1 (vs. 1.0) following a fresh 17 year high back in January. Finally, in the UK, the February CBI trend total orders were a tad softer at 10 (vs. 11 expected). Looking at the day ahead, the flash February PMIs on manufacturing, services and composite are due in Germany, France and the Euro area. Later on we'll then get the same data in the US. Other data due includes December and January employment indicators in the UK, and January existing home sales data in the US. Away from this, the FOMC minutes from the January meeting are due late in the evening, while the Fed's Harker is scheduled to speak on the economic outlook in the afternoon. The BoE's Carney, Broadbent, Haldane and Tenreyro are also due to testify to Parliament's Treasury Committee on the Inflation Report.